Keeping your bathroom facilities clean is crucial for a multitude of reasons – everything from avoiding slip hazards, to minimising the risk of pathogens being spread by surface contact. Hygienic bathrooms are even important for the bottom dollar – Australian employees spend around 2.2 days every year dodging dirtiness in the workplace, including queueing for the cleanest toilet cubicle! 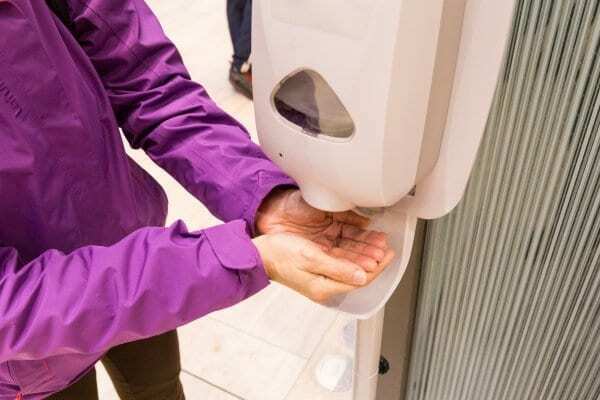 Even through we wash our hands immediately after dispensing liquid soap onto our hands, installing an automatic soap dispenser can reduce exposure to pathogens, viruses and bacteria. It could even increase the number of people who wash their hands; a study by Impulse Research Corporation found that almost 66% of people who use public bathrooms will pull all sorts of manoeuvres to avoid touching surfaces, such as using elbows to open doors! While any sanitary disposal unit is going to be a welcome addition to female bathroom facilities, a unit that’s wall mounted will make it easier for cleaners to sweep underneath and remove dust that can exacerbate asthma, chronic bronchitis or COPD. Indeed, this should be a consideration with all washroom accessories. The new Pod™ Petite is a stylish solution that offers the option of manual or automatic operation that sits snugly on a wall or partition, making it a breeze to clean under and around the system. Like it or not, many people have personal preferences when it comes to drying their hands in a public or workplace bathroom. Eliminate their favourite choice, and they could be less likely to dry their hands properly – and as we know, wet or damp hands are more likely to transmit bacteria than dry hands. We’d recommend including hand dryer and paper towel options wherever possible in high-traffic bathrooms to help control the spread of germs. Every open flush of a toilet can send bacteria flying up to 10 inches above the bowl, as scientists at Leeds University found. Anything you can do to sanitise shared toilets can help to improve hygiene, and therefore promote better health and wellbeing for bathroom users. Australian-made Sweet Lu consists of a small bottle of liquid that simply drops into the cistern and sanitises the toilet bowl continuously for approximately 3 months. It’s one of the easiest additions for great bathroom hygiene. Davidson Washroom is here to help with all of your requirements for bathroom products in Australia.